Map It! Okinawa: "The Beautiful Deigo Tree of Ogimi Village"
"The Beautiful Deigo Tree of Ogimi Village"
This tree goes largely unnoticed for about 10 months out of the year. In fact, you might have zipped passed it a dozen times and never noticed it. But during blooming season, it's very hard to miss and you probably won't see another tree like this for miles. 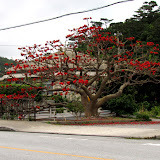 The flower you see above belongs to a very large and beautiful Deigo Tree (Erythrina Orientalis) in Ogimi Village. 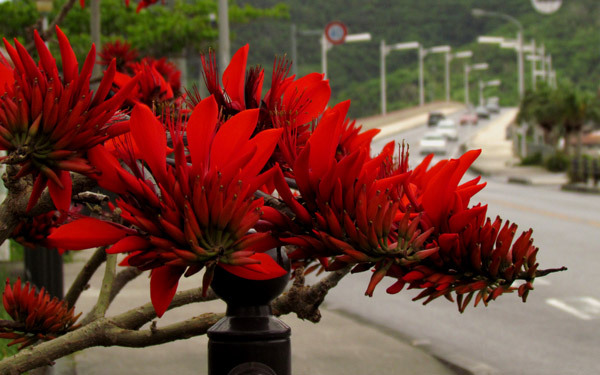 The actual Deigo Flower is Okinawa's Prefectural Flower and has been since 1972. Part of the tree is also used to make the traditional Ryukyuan lacquerware. The blooming season here in Okinawa is usually between March and May (the picture you see above was taken in late April). According to a local villager, this particular Deigo Tree is believed to be over 30 years old. It sits across from the quiet and calm Shioya Bay next to Highway 58.